Looks promising. Fingers crossed there’s a no background image option on the UI though.. They had me until I read "iPad app". 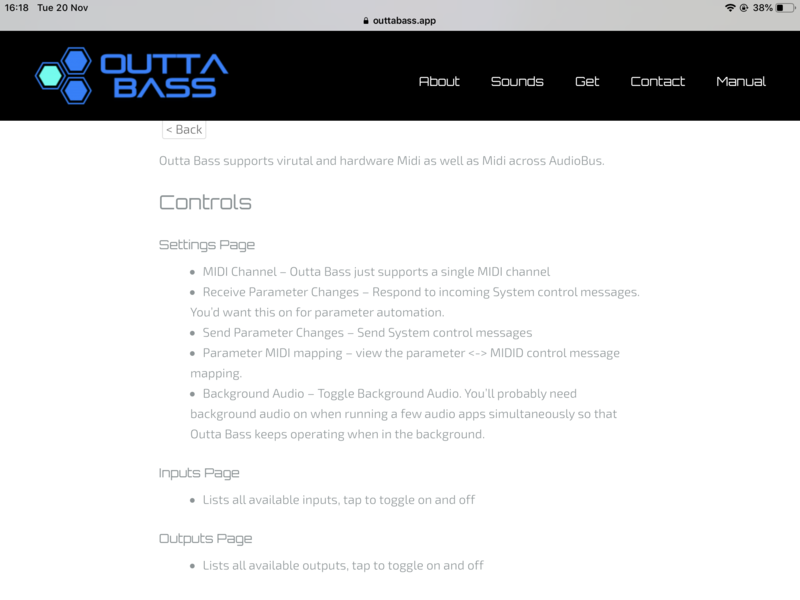 Outta Bass is powered by AudioKit. 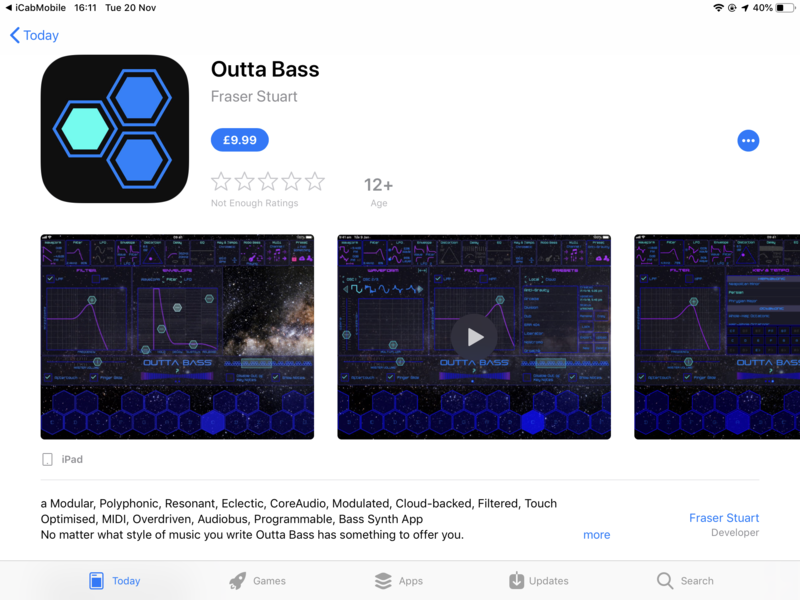 Fraser Stuart, the creator, definitely put a lot of effort into making this app. I've found myself playing with it quite a bit -- it sounds friggin' great! No AU as yet so that’s a downer ! @analog_matt likes it like to see Sir Doug's video first I think. I do like it. I'm probably biased because it's built with AudioKit. But, I think it sounds really nice. Hope he drops you a code. He from down under I think ! Aw. iPad only. 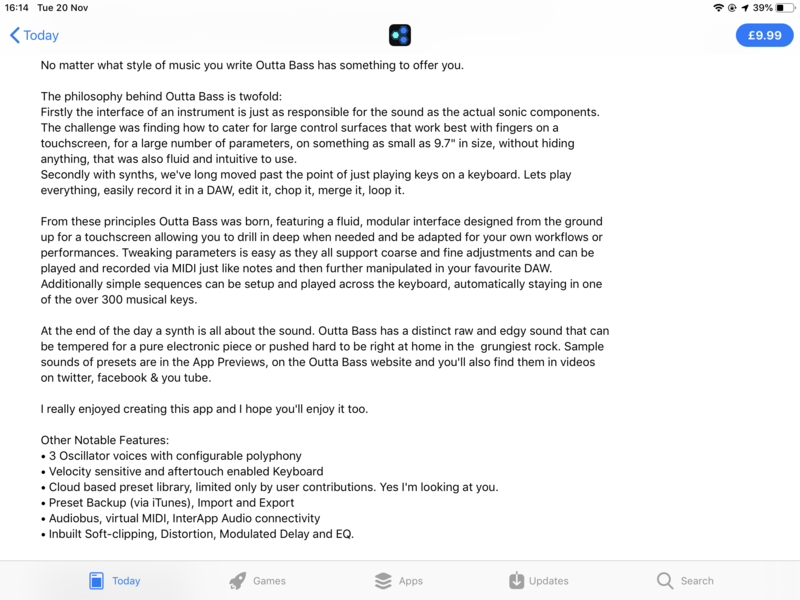 Looks and sounds interesting - I was going to buy it to try it out. I applaud attempts to do something different, though. Sounds better than it looks. I like the modular, drag and drop stuff, makes it easy for idiots (self). And I like the noise. And I like the fact that I opened it right away in Blocs via AB and it sounded/worked great. And I like the fact that it opened in AUM and started working easypeasy and a few other things I like as well but I DON'T LIKE THE COSMOS in the background and I'm thinking there's SURELY a way to just have something dull and plain and blank and let me get on with my work etc . That background image is terrible. Hopefully you can change that. Maybe an "alien spacecraft wall" instead of the cosmos? That way it can have some small lines or effect to give visual interest without being busy and distracting? 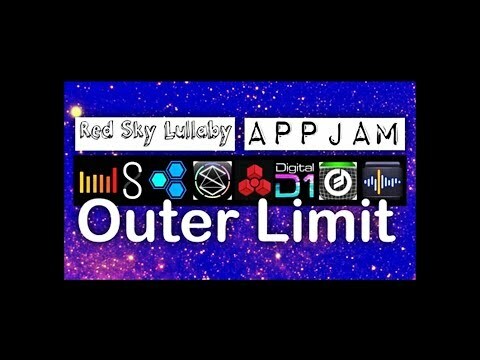 But I don't even have the app, so I'm just making this up. It may be one of those IAAs that Cubasis lists in audio and midi, but not in the main IAA list. is that midi both in and out? I think the background goes with how it sounds and it sounds great, I can imagine running this though a lot of pedals and having a lot of fun with it...... if it has midi in and out???? btw what's the Black Friday price? It says it has Virtual Midi, on that Settings screenshot above. It mentions in and out at the end. Can you modulate the parameters in AUM, ApeMatrix ?